Match fixing is at the centre of it again…… in 2000, Delhi police intercepted a conversation between a blacklisted bookie and the South African cricket captain Hansie Cronje in which they learnt that Cronje accepted money to throw matches. South African government refused to allow any of its players to face the Indian investigation unit. A court of inquiry was set up and Cronje admitted to throwing matches. He was immediately banned from all cricket. He also named Saleem Malik (Pakistan), Mohammed Azharuddin and Ajay Jadeja (India). Cronje exposed the dark side of betting, however with his untimely death in 2002 most of his sources also have escaped law enforcement agencies. Saleem Malik became the first player to get imprisonment; Mohd Azharuddin was banned; ban was later overturned and went on to become an elected MP from Mordabad. In the first match of Asia Cup 2014 - Sri Lanka made 296 for 6 (Thirimanne 102, Sangakkara 67, Mathews 55*) beat Pakistan 284 (Umar Akmal 74, Misbah 73, Malinga 5-52) by 12 runs. Slinga Malinga was at it again – when Pak was having an organized run chase with Misbah and Umar Akmal, Malinga bowled a great spell – he was taken for some runs in his first 5 but the comeback was good enough as he ended up 5 for 52 and a win for Lanka. For sure this match is not under a cloud but is something else. Only recently came the news that this man’s first heavyweight title gloves fetched £520,000 in a sale in New York. The gloves were used by the boxing legend, when he took to the ring against Sonny Liston Miami Beach, Florida, in February 1964. Charles L. "Sonny" Liston was the famed American professional boxer known for his toughness, punching power and intimidating appearance, who became World Heavyweight Champion in 1962 by knocking out Floyd Patterson in the first round. Liston was the most intimidating fighter of his day, and considered by some, at the time of the Clay fight, as among the best heavyweights of all time. Many were reluctant to meet him in the ring. 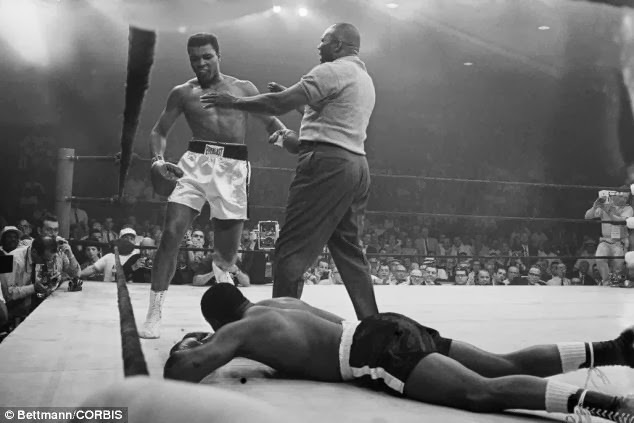 His challenge came to an end before Cassius Clay who weighed 210lbs against Liston at 218lbs, and fought for seven rounds before the former heavyweight retired and Clay was declared the winner by technical knockout. The next day he changed his name to Cassius X but was called Muhammad Ali a week later for religious reasons. This is the story of Cassius Clay (Muhammad Ali), generally considered among the greatest heavyweights in the sport's history. He is one of the most recognized sports figures of the past 100 years, crowned"Sportsman of the Century" by Sports Illustrated and "Sports Personality of the Century" by the BBC. At the age of 22 he won the world heavyweight championship in 1964 from Sonny Liston in a stunning upset. In 1967, three years after winning the heavyweight title, Ali refused to be conscripted into the U.S. military, citing his religious beliefs and opposition to the Vietnam War. Ali remains the only three-time lineal World Heavyweight Champion; he won the title in 1964, 1974, and 1978. Now documents released to The Washington Times under the Freedom of Information Act reveal that the FBI suspected the fight may have been fixed by a Las Vegas figure tied to organized crime and to Liston. The memos, so sensitive that they were addressed directly to Director J. Edgar Hoover, show the FBI suspected Ash Resnick, a Las Vegas gambler with organized crime connections, of fixing multiple boxing matches, including the first Clay-Liston fight. The key new evidence is an FBI memo dated May 24, 1966, that details an interview with a Houston gambler named Barnett Magids, who described to agents his discussions with Resnick before the first Clay-Liston fight. Magids told them that Resnick strongly advised him against betting on Liston winning. The reports also reveal that Resnick and Liston both reportedly made over $1 million betting against Liston in the fight. The documents show no evidence that Ali was in on the scheme or even knew about it, while nothing suggests the bureau ever fully corroborated the suspicions it investigated. The result was such a shock at the time that there was speculation that the outcome might have been manipulated. Liston said he quit because of a shoulder injury, while the Miami Beach Boxing Commission doctor reportedly diagnosed a torn tendon in Liston’s left shoulder. Miami Beach Boxing Commission Chairman Morris Klein said commissioners were satisfied that there was 'no wrongdoing' and allowed Liston to collect his $370,000 purse. A U.S. Senate subcommittee conducted hearings three months later but found no evidence of a fixed fight. Liston was found dead by his wife in their Las Vegas home in Jan 1971. Police determined he died from a heroin overdose, but the cause of death remains controversial. After 5 decades, there is more getting infused in to that historic fight…though nothing appears to be proven. Once doubts are cast, one tends to look with tinted glasses at every other result, as people tend to speak about every close match in Cricket these days.